Following on from last weeks Fab Five Umbrella Stands, I'm going practical again today. But obviously, practical needs to be pretty too. 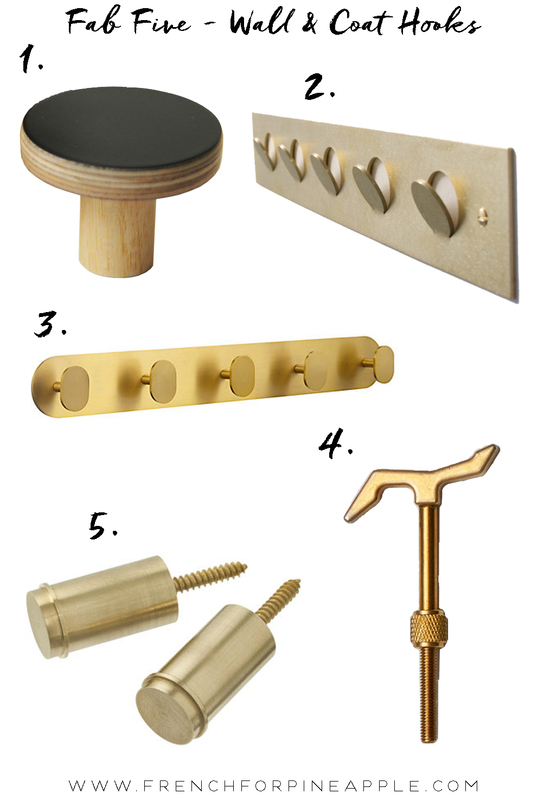 Wall and coat hooks are something I find particularly tricky, mostly because I don't like many. I don't want traditional or rustic, I'm annoying like that. I had a few in mind for this post that I love, and stumbled upon a few more that I'd not seen before that I also love. Handy that. You might notice there's a bit of a theme running through most of my choices! Predictable I know. Some of these are actually too pretty to hang anything on, especially in my house where you can't actually see any of the coat rack because it's so overloaded. Maybe if I got one of these, I might thin out what 'needs' to go on there. I have some of the beautiful hand made Chocolate Creative wall hooks (in black as pictured) waiting to go up in both my daughter's room, for her to hang scarves, bags and jewellery from. I love them - they're so versatile and are available in a huge range of colours.